Looking over the figures, they had very minimal flash, and no ejection pin marks. What mold lines that were there were easily removed with a sharp blade. There are no decals provided and the painting instructions are for Vallejo only. You will need to refer to what you see in the illustration or any references that you may have access to. 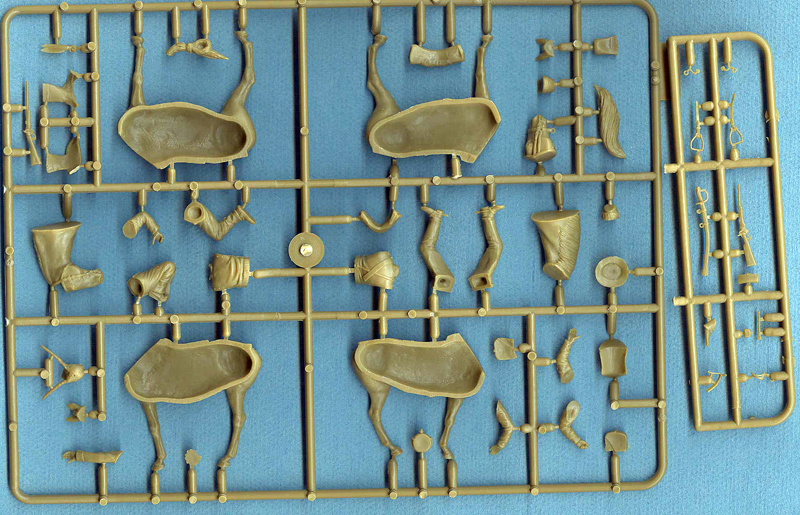 There is not even any part numbers on the sprue, just a picture on the back of the box with the numbers listed next to the part. 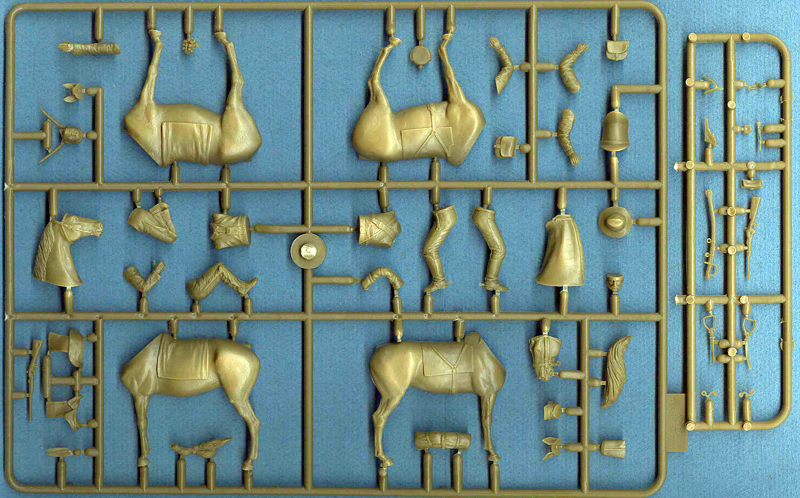 The figures went together without a lot of shaping and filling. They are all balanced so they can stand without pins or glue. The biggest problem with construction was the assembly of the Yankee scout. The rifle and saber were mostly guess work as to where the items went and how they were to be attached. The assembly pictures on the back of the box show several items that are not in the box. The reins, canteen, and saber all require something from your own supplies to make them. I used lead foil and it appears to be okay. The saddle was placed on the horse in the, what I thought, correct direction. I showed it to a civil war buff and he said the saddle should have been reversed. I left the saddle in the original position because the two cloth rolls fit the saddle in this position. However, there is nothing in the "instructions" to show that. As noted there are painting instructions for Vallejo paints only and the photo on the front is only useful for one side of the figures. The intricate patterns on the scout's loin cloth, leggings and chest decoration beg for decals, but there are not any. You will have to stretch your painting skills to paint that pattern or whatever pattern you want to use. Conclusion - Master Box is becoming the leader in vignettes in a box. The kit is very well done and except for the lack of instructions on the parts listed above, the kit is better than my figure painting skills makes it look. Thanks to Master Box and Dragon Models USA, their importer, for the review sample and IPMS/USA for the review space.